Ph.D.in Interior Design , Faculty of Fine Arts, Decor Dept.,Alexandria University, 1999. Lecturer, Dept. of Art Education, Faculty of Specific Education, Alexandria University. Professor of Design, Dept. of Art Education, Faculty of Specific Education, Alexandria University. 2011. Vice Dean for Graduate Studies and Research, Faculty of Specific Education, Alexandria University. 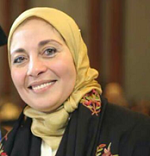 Vice Dean for Graduate Studies and Research, Faculty of Specific Education, Alexandria University. .
Dean of Faculty of Arts & Design, Pharos University. “Upgrading the learner’s capabilities on thinking creatively to create ornamental decorative units from some nature elements to enrich the interior space furnishings” , Poster Research, the 5th International Conference on Education and New Learning Technologies, Barcelona, Spain. “Service Learning Experience Application in Interior Architecture for Undergraduates” ,Poster research, the 8th annual international conference of Education, Research and Innovation, Sevil , Spain.